The 'Killer Fungus': Should We Be Scared? If you were keeping a watchful eye on the news feeds on Friday, you probably heard about a new strain of deadly fungus called Cryptococcus gattii that has emerged in Oregon and Washington, and is threatening to spread into California. If you're like me, you are also probably confused about how worried you should  or shouldn't  be about this killer pathogen. The news reports have managed simultaneously to raise the alarm about the new bug while warning people off undue hysteria. Consider this ABC News headline "Fatal Fungus Cryptococcus Gattii: Experts Say Fears Overblown," which strangely dismisses a fear of its own making. And then there's an article on Health.com that details the rise of the deadly new strain, then exhorts readers not to worry: "Besides, there's not much you can do to protect yourself from it in the meantime." Huh? So I should be very, very afraid  just not really? To be fair, it was a scientist  Edmond Byrnes, a graduate student in microbiology and molecular genetics at Duke University  who triggered the fungus frenzy. His paper, published Thursday in PLoS Pathogens, reported that detailed genetic analyses had revealed that two strains of C. gattii, a fungus that typically lives in trees and soil, had become hypervirulent. Byrnes' paper looked at six deaths and 15 other infections in people, and 21 cases in animals that had occurred in the U.S. between 2005 and 2009. Combine the words "hypervirulent" and "infection" in the age of SARS, bird flu and H1N1, and it's a news story. But here's what you really need to know: "These infections are still rare, and from an overall health perspective, I don't think anyone should be concerned, but should just be aware that it is increasing geographically and incidence-wise in [the Pacific Northwest]," says Byrnes. "For the average person, I don't think this is anything to be too worried about." C. gatti is normally found in tropical climates in South America, Australia and Papua New Guinea. In these endemic regions, it tends to favor eucalyptus trees and, according to Julie Harris, an epidemiologist in the mycotic diseases branch of the Centers for Disease Control and Prevention, rates of infection among people are relatively low. The fungus was somehow carried from the southern hemisphere to North America, where it was found on Vancouver Island in 1999. (It was rare  at its peak, between 2002 and 2005, there were 36 cases per million population per year in the region reported to health officials.) One of the new strains of highly virulent C. gattii was determined to have originated on Vancouver Island; the other is thought to have emerged in Oregon, possibly from a strain that had spread south from British Columbia. In lab animals, Byrnes reports, these two strains are 100% lethal, causing death within three weeks. That's reason for concern from a scientific standpoint, he says, since other known strains of the fungus are not as deadly. But, again, the fungus is so rare in the real-world, that from a public-health perspective, there's no need for alarm. The question is why the Pacific Northwest strains appear to be more aggressive than the fungus in its native tropical habitat. One reason could be that the more temperate climate of the Northwest pressured the pathogen to mutate in order to survive. 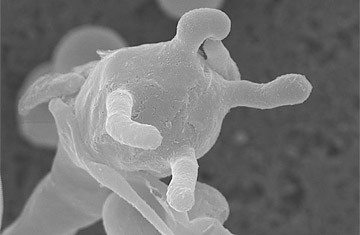 In addition, exposure to a new environment and new hosts could be pushing the fungus to change. Scientists' immediate concern is the possibility that C. gattii will spread farther south into California, says Byrnes; already cases have already been reported in San Francisco and Los Angeles. "We don't know how these more pathogenic [strains] arose, how they were selected for and how they got to this region of the world," he says. "Those are still questions that everyone is trying to figure out now." Which makes it all the more frustrating for anyone who has recently developed fungus anxiety. Worse, you can't see the fungus  it's microscopic  so you can't protect yourself from it. It's not detectable on trees or in soil; it's only identifiable by its spores in the air, if you're sampling for it specifically. So far, in the U.S., experts have only been able to infer that the fungus is growing in the environment because of the couple dozen cases of reported human infection. "Efforts to isolate the fungus from the environment have been unsuccessful. We suspect it's there but we haven't found it yet," says Harris. And nobody knows exactly how people are infected by it, although scientists suspect it might be by breathing in fungal spores. In the past, Cryptococcus infections have been more common among HIV positive patients, who are immunocompromised, but the newer strains have infected healthy individuals as well. So, does that mean Pacific Northwesterners and their pets should stay indoors to avoid exposure or infection? Do they stop going on hikes and steer clear of wooded areas? No, no and no, says Harris. At the moment, it's simply important for health-care workers to be aware of the spreading fungus, so they can make the right diagnosis and begin proper treatment if necessary. Byrnes advises doctors to be mindful if otherwise healthy folks develop symptoms of infection, such as a persistent cough, headaches and night sweats, that mimic pneumonia or meningitis. While there is a treatment for the infection, it isn't an easy one. It involves several months of a daily intravenous drip with an antifungal solution, followed by several more weeks of an oral treatment to stop the infection. Still freaked out by the fungus? Take solace in the one thing scientists do know based on the few cases that have surfaced so far: the fungus is not contagious, and cannot be passed from an infected person to anyone else. See a TIME piece on an industrial-strength fungus.